You might get nervous or anxious from time to time— when talking in public, for instance, or when going through stress in life. But for some people, however, anxiety becomes so frequent, or so forceful, that it begins to take over their lives. How can you tell if your everyday anxiety has crossed the line into a problematic disorder? We know, it’s not easy. Anxiety comes in many different forms—such as panic attacks, phobia, and social anxiety—and the distinction between an official diagnosis and “normal” anxiety isn’t always clear. 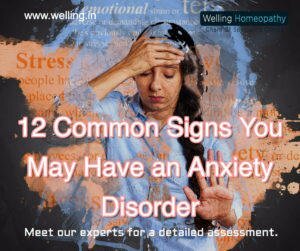 Here’s a start: If you experience any of the following symptoms on a regular basis, you may want to talk to our doctors for a detailed assessment and our specially formulated Homeopathy treatment for Anxiety Disorders. For a detailed assessment and complete treatment of Anxiety Neurosis, visit any of our clinics in Mumbai.